Edward Tipper, ‘Easy Company’ D-Day survivor and Museum friend. 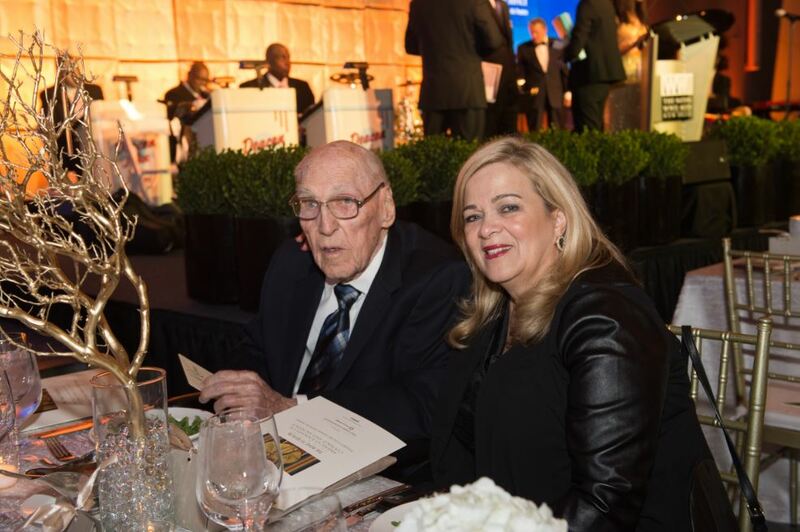 Edward Tipper, an American hero and extraordinary friend to The National WWII Museum, has died at age 95. Tipper jumped into Normandy with “Easy Company” on D-Day—a mission immortalized in Museum founder Stephen E. Ambrose’s book Band of Brothers and in the later HBO miniseries of the same title—and volunteered his time on numerous occasions to share his WWII experiences and advocate for the significance of the Museum’s mission. We grieve his loss and for his family, but celebrate his long, full life and courageous service to the forces of freedom. We are proud to count an oral history recorded by Tipper among the Museum’s collection of more than 9,000 first-person accounts of World War II. “He was one of the great ones of Easy Company—tough, humble, generous, honest, never exaggerated his role in training or in combat,” said Museum founding president & CEO Gordon H. “Nick” Mueller, PhD. Tipper and Dr. Mueller appeared together at Museum events in California, New Orleans, and North Carolina, at which they discussed Tipper’s training with Easy Company in Georgia and England, his D-Day experience, and the harrowing days that followed. Tipper’s interviews were always unique and hugely popular with audiences. Born in 1921 and raised in a working-class area of Detroit, Tipper first tried to enlist in the Marine Corps following the attack at Pearl Harbor. When he was refused induction due to an improper overbite, “I felt like punching someone,” he once told a reporter. Instead, Tipper volunteered for the paratroopers and joined Easy Company of the 506th Parachute Regiment, 101st Airborne Division, at Camp Toccoa in Georgia. 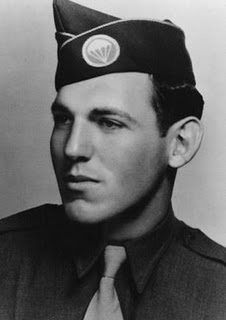 When Tipper was asked in interviews if there was one good thing he could say about Captain Herbert Sobel, the controversial early commanding officer of Easy Company, Tipper credited the tyrannical officer’s physical training demands, saying they ultimately helped to save his life. Tipper was wounded on June 12, 1944, when he and Easy Company were engaged with the enemy at the town of Carentan. As he finished clearing out a house, a mortar shell exploded near Tipper, destroying his right eye. He also suffered breaks in both legs. Fellow Easy Company members Joseph Liebgott and Harry Welsh were the first to reach Tipper and carried him to a nearby aid station. Tipper was sent to a hospital in England, and later to the United States, where he spent a year in army hospitals before returning to civilian life. Tipper earned a Bronze Star and Purple Heart for service, among other honors. In 2011, he received the French Legion of Honor Medal, the highest honor awarded by the French government. Bart Ruspoli, who portrayed Tipper in Band of Brothers, spoke with Tipper on the phone several times during production, and met him at the 2001 world premiere of the miniseries, staged in Normandy. After the war, Tipper attended the University of Michigan and received a masters degree from the University of Northern Colorado. He was a high school teacher in Iowa and Colorado for nearly three decades, and received a John Hay Fellowship in 1960 to study English at the University of California, Berkeley. He also traveled widely with his family, which he started late in life. Tipper married for the first time at age 61, and is survived by his beloved wife, Rosie, and daughter, Kerry. “We didn’t talk about the war,” wrote Kerry Tipper in a Facebook post about her last conversation with her father. “His greatest sense of pride and accomplishment came from being a loving son to his mother. It came from his near 30 years of teaching. From his years traveling the world. And finally from the 34 years he gave to his small but adoring family. 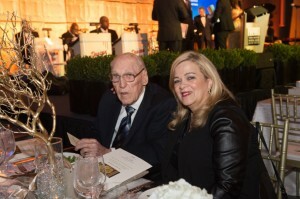 Edward Tipper and his wife, Rosie, attended the Road to Berlin grand opening in December 2014.